The Portland Timbers today announced that single-game tickets for the first eight regular-season home matches at Providence Park go on sale to the public Friday, Feb. 20, at 10 a.m.
Single-game tickets again will be available for purchase in two phases in 2015, with tickets for the first eight home games through June 20 available for purchase starting Friday. A second on-sale date for single-game tickets for the final nine regular-season games will take place at a later date. 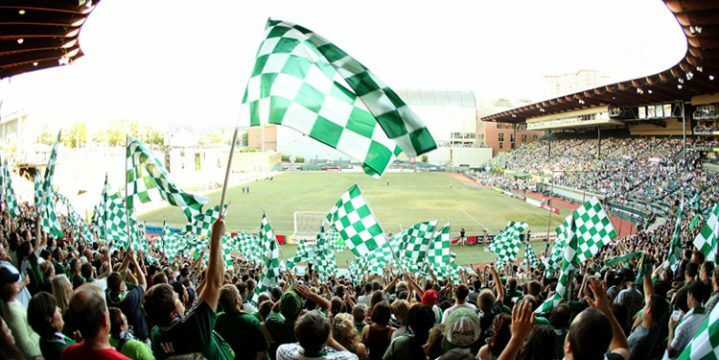 Fans can purchase single-game tickets, starting at $18, online at www.timbers.com or by calling (888) 736-6849. Additionally, fans can purchase single-game tickets at the Providence Park box office starting Friday. Box office hours are Tuesday through Thursday, 10 a.m. to 2 p.m., Friday and Saturday, 10 a.m. to 5 p.m. (closed Sunday and Monday). A special online-only presale for Timbers season ticket holders and members of the Timbers Season Ticket Waiting List will take place Thursday, Feb. 19, at www.timbers.com. Since joining MLS in 2011, the Timbers have sold out all 68 regular-season matches at Providence Park. The club opens its fifth MLS season on Saturday, March 7, at Providence Park as they play host to Real Salt Lake at 7:30 p.m. (Pacific). Group opportunities for Timbers home matches are available by contacting the Timbers ticket office at (503) 553-5555 or ticketsales@timbers.com. Additional group information can be found at www.timbers.com/tickets. Additionally, tickets are on sale for the 2015 Simple Invitational. The annual preseason tournament will consist of three doubleheaders at Providence Park from Feb. 22-28 between the Timbers, Chicago Fire, Vancouver Whitecaps FC and Norwegian Tippeligaen club Stabæk, coached by former U.S. Men’s National Team head coach Bob Bradley. Individual tickets, which allow entry into both matches each day, start at $13 and are available online at www.timbers.com. Three-game ticket packages for the Simple Invitational, starting at $33, are also available for purchase online. Group tickets are available by contacting the Timbers ticket office. Jake Donahue is more of a Ron Burgundy than he is a Ben Simmons. He does have a background in journalism, sports writing and marketing, though. And he owns the Donahue Media Group, a local web design and project management company, as well as a real estate marketing firm, Portland Picture. Born and raised in the Pacific Northwest, he grew up a Mariner fan before launching his own Little League coaching career.